Have you taken the healthy step of including nuts in your daily eating habits? Perhaps you’re eating nuts because of their healthy fats. Or, because you’re eating a more clean, plant-based diet. Or, because they make a great protein-rich snack that doesn’t need to be refrigerated. Whatever your reason, nuts certainly are a healthy food to include regularly. When I work with clients, I look to have them eat nuts and seeds frequently. The good news is that word about how healthy nuts are seems to be getting out to people. Most clients I see are eating nuts several times a week. However for a large number of clients, eating nuts equals almonds. Only almonds. It may be whole almonds, almond butter and/or almond milk, but the only nut or seed that they’re eating is almonds. This is a problem. Variety is Better Than Any 1 Food: We humans are omnivores. Your body is designed to eat a wide variety of foods. Yet, so many people eat the same few foods over and over again. Nuts and seeds are all different. Some have more healthy fats, some have more protein, and they vary in the amount of minerals and other nutrients. By sticking to only one or two nuts/seeds you are missing out on many of the benefits of different nuts/ seeds. And, when you eat a lot of only a few foods, you can get too much of some nutrients. California Drought: Most of our almonds come from California. Did you know that California has been experiencing a drought for years? And, that their ground water is decreasing fast. Did you also know that almonds trees take a large amount of water? It’s not a good combination. Before you throw the baby out with the bathwater (I hate that saying, do you know of a less violent one that expresses the same meaning? ), please note that I’m not saying to never eat almonds again. What I’m saying is that considering that eating a variety of foods is a healthier choice, now’s a good time to take the pressure off of California water sources by expanding your nut and seed repertoire. Enjoy almonds amongst a wide variety of nuts and seeds. There’s a whole world of nuts and seeds out there. Explore it. I do - half a shelf of my fridge is taken up with nuts and seeds. And yes, you want to store them in the fridge to keep them from going rancid. Here’s some ideas of nut and seeds to check out. Alternatively a trip to your local bulk food section can inspire you. Hazelnuts (Get these while you can. There’s a blight wiping out all the trees in North America). Coconut Oil: Is It Healthy? Will It Make You Lose Weight? Once a year, UBC students who are training to become dietitians do a project where they write short articles for dietitians. This article was written by Nicki Kontogiannis and Frankie Reinbolt. Now, what to ask them to write about? That was easy. I think that you’d have to be living under a rock to not have noticed the explosion of coconut oil in grocery stores and on menus. Coconut oil is being marketed as a healthy fat, that it causes weight loss, and all sorts of other benefits. So, I asked them to look into the scientific research to find out if it’s really a healthy choice. Here’s what they found out. Unrefined coconut oil, also called ‘virgin coconut oil’, has a sweet, light coconut flavour and is great for baking or lightly sautéing. Refined coconut is more processed, tasteless and is better for cooking at higher temperatures. Raises HDL (good) Cholesterol: Coconut oil has been associated with high HDL cholesterol levels. It also does not increase LDL (bad) cholesterol and total cholesterol levels to the same extent as other saturated fat sources, such as butter. Good for Cooking: Coconut oil has a higher smoking point making it suitable for frying as it can withstand high heat. It also works particularly well in baked goods as it has a “nutty” flavour. RaisesLDL (bad) Cholesterol and Total Cholesterol (TC): As mentioned above, coconut oil does not raise LDL and TC levels to the same extent as butter; however, it still increases both to a greater extent than vegetable oils, and a rise in overall cholesterol levels in the blood can be linked to cardiovascular disease. High in Saturated Fat: Coconut oil is 86% saturated fat. 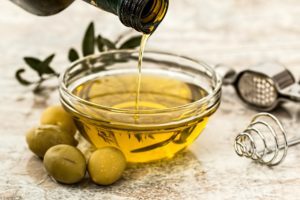 The scientific community is learning more about saturated fat’s effect on our bodies, and that not all saturated fats (e.g. butter vs coconut oil) may have the same effect on us. Not enough has been learned yet to clearly say whether the saturated fat in coconut oil is healthy or harmful for our health. Significant Source of Calories: Like all fats, coconut oil is a concentrated source of energy (calories). Can coconut oil burn fat? The studies that have been done so far on weight loss should be viewed through a critical lens. These studies had small sample sizes, short study periods and subjects were also exercising and eating healthier. Thus coconut oil may not have been the determining factor for weight loss. Can it prevent cancer and boost immune function? There is no scientific evidence to prove this. Nicki & Frankie: It is important to remember that regardless of the type of fat, all fats contain 9 kcal/gram and too many calories in any form can lead to increased weight gain. Coconut oil should be enjoyed in moderation. Kristen: I’m not jumping on the coconut oil bandwagon until we learn more about how different saturated fats affect our heart health. And, I’ll want to see much more research before I believe that coconut oil causes weight loss. I use it occasionally in baking – it’s great when you don’t know if there may be vegan people you’re baking for. Otherwise, I stick to olive oil for most of my cooking. I like to support local farmers, and I love the taste, so I continue to use butter on the occasion that I want a solid fat. I put milk in my coffee. McGee, H. (2004). On Food and Cooking: the Science and Lore of the Kitchen. New York, NY: Harold Scribner. Davis, B., Vesanto, M.(2014). Becoming Vegan. Summertown, TN: Book Publishing Co.